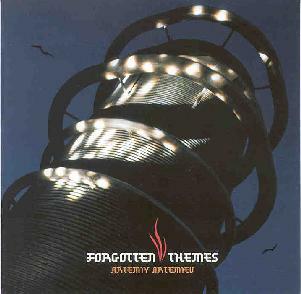 Artemiy Artemiev - "Forgotten Themes"
Russian electronic musician Artemiy Artemiev returns with a collection of tracks (presumably unreleased) recorded between 1988-2000. Artemiy heads up the Electroshock label and is the son of composer and electronic music pioneer Edward Artemiev. I believe Forgotten Themes is his sixth release. Most of the CD features Artemiy's electronic compositions, but three tracks include Aleksei Alashaev on guitar and Sergei Suleimenko on bass, and one track features Dmitriy Kutergin on violin. "Theme From Motion Picture The Fan-I & II" opens the set, coming across like a symphonic power trio, with Artemiy handling the melodies and electronic percussion and Alashaev's guitar blaring out power chords. It also has a bit of a Pink Floyd circa Wish You Were Here sound, though while we do hear some Rick Wright keyboard lines and a bit of spaciness, Artemiy's keyboard style is far more orchestral. "Where East Meets West" is an interesting quirky tune that includes nice whining Frippoid styled licks from Alashaev. "Realm Of Shadows" is a standout track on which the keyboards create an intense, pounding backdrop for Kutergin's violin playing an emotional melody. "The Last Waltz" and "An Evening In The Country" would appeal to fans of symphonic keyboard driven progressive rock. "The Last Waltz" communicates a powerful orchestral sensibility, but also includes traces of traditional folk themes. Artemiy also shows us he can travel beyond the Earth's atmosphere on "Calvary" and "Space Distortion". "Calvary" is a multi-layered piece that combines beautiful keyboard sounds and melodies with a healthy dose of freakier spacey sounds. And "Space Distortion" features rushing waves of space drones that weave their way through the cosmos, encountering a series of bangs, gurgles, and howls, and what sounds like screaming string sections. Headphones are needed to appreciate all that's happening on this gripping ride. Finally, "An Autumn Breath" is a lengthy track that I'm not sure what to make of. It's a slow piano piece that develops very little over its 18 minute length. There's a secondary piano line that's also slow, but along with snare-like percussion sounds almost jazzy. Dark and haunting, the track would work well if part of a film soundtrack, but as a standalone piece of music it went on a bit too long for this listener. But overall, this is a fine set of music that features the many sides of Artemiy's music making Forgotten Themes a good starting point for exploring his world.